Sharing a common cultural heritage, Eastern and Western Europe have developed different paths of scholarship and learning. At the root of these traditions is the tradition of European humanism and its scholarly community. We believe that today it is more important than ever to think the legacies of humanism, to build our knowledge and values on them and to share their experience. “Cultural and Intellectual History Between East and West” is a double degree master’s programme that brings together the best traditions in scholarship in East and West. The subject of the programme is the history of cultural contacts—in philology as well as in cultural and intellectual history—between Eastern and Western Europe from the Middle Ages to the twenty-ﬁrst century. The programme imparts philological and historical skills that enable students and future scholars to work with primary sources and to trace cultural, intellectual and linguistic processes to their sources. 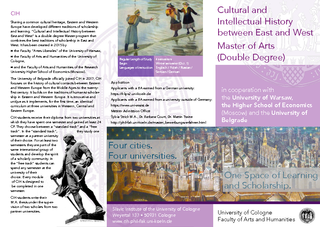 For the first time, the programme implements an identical curriculum at four different universities in Western, Central, South Eastern and Eastern Europe. The programme builds upon a tradition of interdisciplinary humanist scholarship and learning in philology, history, and cultural studies. It has been shaped by the Faculty “Artes Liberales” and its predecessor institutions over several decades. The tradition is marked by a clear focus on primary sources and the understanding of historical, linguistic, and cultural contexts. It is characterized by a methodological rigour which aims to make the scholarly approach universal and independent of theories that are fashionable at a certain place or at a certain time. We are looking for ways of learning that reveal timeless values, and we are reflecting on how we can apply these values in our lives. This approach aims at conveying and at actively developing scholarly skills that prepare students to take up a PhD on a related topic at different scholarly environments in Eastern and Western Europe.